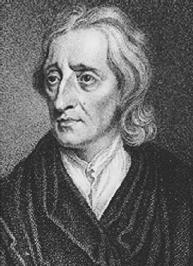 John Locke was a seventeenth-century English philosopher whose writings on political theory and government profoundly affected U.S. law and society. It is chiefly from Locke's Two Treatises of Government (1690) that U.S. politics takes its core premises of the ultimate sovereignty of the people, the necessity of restraints on the exercise of Arbitrary power by the executive or the legislature, and the ability of the people to revoke their social contract with the government when power has been arbitrarily used against them. The Declaration of Independence and the U.S. Constitution are testaments to many of Locke's central ideas. Locke was born in Wrington, Somerset, England, on August 29, 1632. His father, also John Locke, was an attorney, and a Calvinist with Puritan sympathies who supported the parliamentary side in England's struggle against King Charles I and fought on that side in the English Civil War of 1642. Despite this background Locke developed monarchist leanings while attending boarding school, which remained with him throughout his life. In 1652 Locke entered Oxford University, where he became interested in medicine and the newly developed discipline of experimental science. He collaborated with Robert Boyle, a founder of modern chemistry. Locke studied natural science and philosophy, concentrating on the principles of moral, social, and political laws. Following graduation in 1656, he earned a master of arts degree and was appointed a tutor at Oxford. He left teaching in 1662 and in 1666 decided to pursue medicine. In 1668 Locke was elected to the Royal Society. In 1675, plagued with the symptoms of consumption, Locke moved to France in the hope of improving his health. He studied philosophy while abroad, then returned to England in 1679. His friendship with the duke of Shaftsbury made his stay in England a short one. Shaftsbury had been discovered as having been involved in a conspiracy to overthrow the king. Though Shaftsbury was acquitted of the charges, he fled to Holland in 1683. The king became suspicious of Locke and other friends of Shaftsbury, and had Locke closely watched. Knowing that his personal safety was at risk, Locke also chose exile in Holland in 1683. In 1684 his name appeared with eighty-three others on a list sent to The Hague by the English government, with the accusation that those named had committed Treason and a demand for their Extradition by the Dutch government. Locke went into hiding for a while, but soon returned to public life when the Dutch refused the extradition request. While in Holland, Locke wrote Essay Concerning Human Understanding (1690) and Two Treatises. Essay set forth Locke's theory that all human knowledge comes from experience. It stated that people are born without ideas—that is, with a blank mind—directly challenging the belief that people are born with certain knowledge already implanted. It further stated that as a result people must formulate their ideas based on experience. This theory became the basis for the school of English philosophy called empiricism. Two Treatises was written when England was divided over the rule of King James II. The Protestants wished to remove the king, who was a Roman Catholic. In the Glorious Revolution of 1688, James abdicated the throne and Parliament offered the crown to the Dutch prince William of Orange and his wife, Mary. The revolution reformed government along the lines outlined by Locke in Two Treatises, which was published in 1690. England became a constitutional monarchy, controlled by Parliament, and greater measures of religious toleration and freedom of expression and thought were permitted. Two Treatises was a blow to political absolutism. The first treatise was a refutation of the theory of the divine right of kings, which posits that monarchs derive their authority from God. The second treatise had the most lasting effect, for it set out a theory of politics that found its way into U.S. law. In this second treatise, Locke maintained that people are naturally tolerant and reasonable, but that without a governing force, a certain amount of chaos and other inconvenience will occur. In his view people are basically pacific, communitarian, and good-natured. This belief contrasts with that of philosopher Thomas Hobbes, which is that if left to their own devices, people will live in violent, selfish anarchy. For Locke all people are inherently equal and free to pursue "life, liberty, health, and property." To do this they engage in a social contract in which they consent to give up a certain amount of power to a government dedicated to maintaining the well-being of the whole. They also give up one right, the right to judge and punish other persons, which is permitted in the state of nature. Apart from that concession to government, Locke argued, a person's individual right to freedom of thought, speech, and worship must be preserved. In addition, a person's private property must be preserved by the government. This compact between the people and their rulers legitimizes the government and explains the source of the rulers' power. Locke believed that the people's consent to give up some power is the essential element of the social contract. Government is the trustee of the people's power, and any exercise of power by government is specifically for the purpose of serving the people. By extending the trust analogy, Locke legitimized the concept of revolution. If their trust is abused by their governors, the people—the grantors of the trust—have a right to revoke the trust. Once the trust has been revoked, the people can assume the reins of government themselves or place them in new hands. Locke attempted to soften this justification for revolution by claiming that revolution is appropriate only as a last resort and only in extreme circumstances. But he gave no real guidance as to how the people can be trusted to distinguish between inevitable temporary aberrations, which are to be endured, and a long series of abuses that justifies rebellion. Two Treatises was well received in England, making Locke a respected figure once more and the intellectual leader of the Whig Party. He returned to England in 1689, following the Glorious Revolution. He lived in semiretirement in Essex, in the company of friends such as the scientist Sir Isaac Newton. He died October 28, 1704, in Oates, Essex. Two Treatises commanded great interest in the eighteenth century, providing justification for the American Revolution in 1776 and the French Revolution in 1789. The U.S. Declaration of Independence uses Locke's ideas of the law of nature, popular sovereignty, and the sanctity of the right of private property to set forth the premises of U.S. political thought. The U.S. Constitution, with its separation of church and state and its guarantee of personal freedoms, draws on Locke's work. "It is one thing to show a man thatheisin error, and another to put him in possession of truth." In the United States, Lockean thought continues to justify resistance to executive tyranny, such as the despotism that was exhibited by President richard m. nixon in the Watergate affair in the early 1970s and led to his resignation in 1974. Locke's second treatise provides support for U.S. constitutional ideals of inalienable rights and personal liberty. The First Amendment would be unthinkable without Locke's philosophical foundation. Damstedt, Benjamin G. 2003. "Limiting Locke: A Natural Law Justification for the Fair Use Doctrine." Yale Law Journal 112 (March): 1179. Heyman, Steven J. 2000. "Natural Rights and the Second Amendment. Chicago-Kent Law Review 76, (fall): 237–90. Richards, Peter Judson. 2002. "The Law Written in their Hearts? : Rutherford and Locke on Nature, Government and Resistance." The Journal of Law and Religion 18 (winter): 151–89. Constitution of the United States; Natural Law; "Second Treatise on Government" (Appendix, Primary Document). Locke, "Ecclesia," in Locke, John Locke: Writings on Religion, ed. Amongst the one-time Catford trainers present were Alison Ingram (now at Romford) and Ken Tester (Hove), along with Maxine Locke, John Simpson and Tony Taylor, all of whom are now Wimbledon-based. In making his case against Islam, Warraq not only uses Bertrand Russell's "Why I am Not a Christian" model but also relies on citing long quotations from the works of Thomas Carlyle, Bruno Bauer, David Hume, Thomas Hobbes, Edward Gibbon, Thomas Paine, John Locke, John Stuart Mill and Voltaire, as well as an array of lesser-known literary artists, rationalists, historians, philosophers and scientists.